Semi-formal evening wear doesn't always need to consist of heavily embellished chiffon pieces or tight body con dresses. Cocktail dresses and high heels tend to suffocate me so when the need arises, I try to be more creative and find alternative ways to adhere to the dress code. It may not be for everybody but for me, this is the most comfortable way I can think of marrying semi-formal wear and street style. Instead of opting for an LBD, I matched a semi-cropped top with a midi skirt to create an interesting silhouette. I also like the unexpected touch of heavily chained boots instead of the usual pumps. This is what I wore to the Paco Rabanne Eau De Gold "fragrance tasting" and the intimate Savoy Watch event that I have yet to blog about but I'm wearing one of my favorite watches from their new collection in the photo below, a rose gold face with an interchangeable rubber strap and accents. So there you go, hope you liked this ootd ☺. Keeping it pretty short for now since I've been feeling a bit under the weather since we got back from Baguio yesterday. We visited Baguio Craft Brewery and it was extremely cold that night. I think that's what got to me plus the sudden change of weather in Manila's heat. Hi, yeah I really love your ootd here, that's so bongga! It's looks so comfortable and so classy. Thank you for another fashion inspiration. I love how you put chains with those shoes. You look gorgeous as ever! And clap! Clap! Clap! For the MB feature. Good Job Sis Sarah! I hate mouthwash that stings so Oracare is my choice too. I love Kathryn!!! Hehehe! #KathNielFan Anyway, we also us OraCare its no sting. Others are super sakit sa bibig eh. I really love how you dress up, Sarah! a lovely ensemble. love the black chic look! 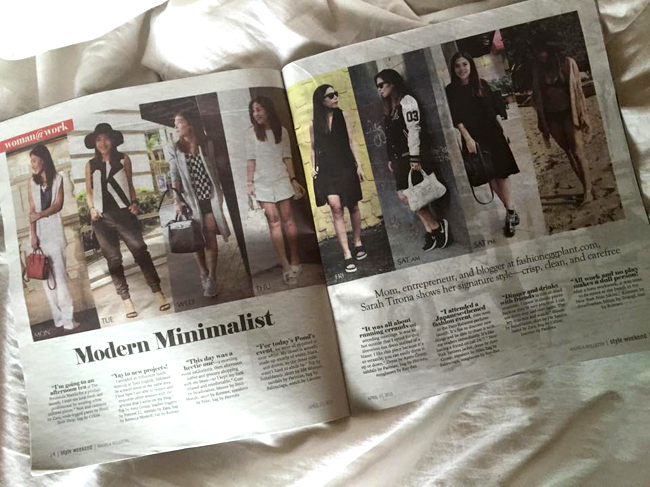 congrats on your Manila Bulletin feature! I also like OraCare as I don't really enjoy the feeling of being stung in the mouth haha! Tried Oracara before and I love it! Ang ganda, bet ko ang look nato hahahahaha I wanna recreate but sana it hides my big tummy. I used Oracare before. love the non-stingy effect. I like Kathryn, she's so cute. I love using Oracare too. This is so classy Ms. Sarah! Such a great ensemble!